The Howard County Human Rights Commission is pleased to announce that the Honorable James Robey, Maryland State Senator, and The Council of Elders of the Black Community of Howard County, MD are the recipients of the 2013 Human Rights Award. The award is given annually to individuals and/or organizations selected by the Commission from nominations submitted by the community. An award ceremony will be held on Tuesday, November 12 at 7 p.m. at Slayton House in Wilde Lake, 10400 Cross Fox Lane in Columbia. The award ceremony is free and open to the public; however, seating is limited. To reserve your seat, please call the Human Rights Commission Award reservation line at 410-313-1156. The Human Rights Commission Award honors individuals and community organizations for contributions to human and civil rights in Howard County. The purpose of the award is to recognize exemplary citizenship, dedicated leadership and outstanding achievement in eliminating or eradicating discrimination, while advancing human rights for all residents of Howard County. Past recipients of the Human Rights Commission’s Award include: Elisa Montalvo and the Howard County NAACP Youth Council (2012); Carol A. Beatty and the Community Action Council of Howard County, MD, Inc. (2011); Rufus F. Clanzy (2010); Dr. Edward Cochran (2009); Dr. Sydney Cousin and Leola Dorsey (2008); and Colette Roberts and Rev. Dr. Robert Turner (2007). For more information about the award and/or the ceremony, please contact the Office of Human Rights at 410-313-6430. The African American Community Roundtable in partnership with The Howard County Public School System is sponsoring an African American Community Education Forum on Monday, September 30, 2013 from 6:00 – 9:30 pm. This event will take place at Long Reach High School – Auditorium, 6101 Old Dobbin Lane, Columbia, MD 21045. Please join the Council of Elders at this very important event for our community! Don’t forget that tomorrow marks the 50th anniversary of one of the most famous events in American History…THE March on Washington. There may be many other marches in history, but none greater than the August 28, 1963 march led by Dr. Martin Luther King, Jr. King’s “I Have a Dream” speech will forever live in our hearts and minds as a pivotal point in the fight to bring down the walls of racial segregation in America. 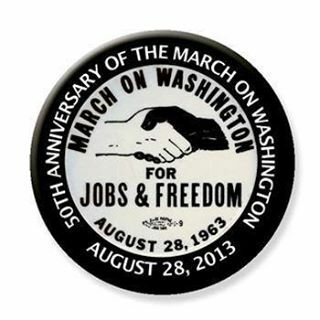 Americans will commemorate this historic event by marching again on tomorrow, August 28, 2013. Whereas the 1963 march was a call for “Jobs and Freedom”, tomorrow’s march will be to address “Jobs and Justice” in America. As tomorrow’s march concludes on the National Mall, President Barack Obama will address the nation from the steps of the Lincoln Memorial. The march begins at 8:15 am when people will gather at 600 New Jersey Avenue, N.W. Washington, D.C. and march to the steps of the Lincoln Memorial to hear the President speak from the very spot where Dr. King delivered his “I Have a Dream” speech 50 years ago. The missing link in Black History? The Criminal Justice System in the Time of Trayvon Martin: JUSTICE OR “JUST US”? In the aftermath of the Zimmerman verdict, what is our responsibility for our criminal justice system? Join moderator A. Adar Ayira, Project Manager of the More in the Middle Initiative at Associated Black Charities and senior consultant/trainer for Baltimore Racial Justice Action as she probes for answers from Ray Winbush, Ph.D., Director of the Institute for Urban Research at Morgan State University; Russell Neverdon, Esq., attorney for Christopher Brown; Camilla Roberson, staff attorney at the Public Justice Center; and Fraser Smith, senior news analyst for WYPR and Baltimore Sun columnist. Are black students getting fair access to good teachers? Interesting article on the quality of instruction that is available to black students. Article is part of a series examining the state of Black America. Please join The Council of Elders on Sunday, August 11th at 3:00 p.m, as we participate in a service to pray for our students for the 2013/2014 school year. This service, sponsored by Howard County PRAY, will be held at Bethel Christian Academy located at 8455 Savage-Guilford Road, Savage MD 20763, two minutes from the intersection of Routes 32 and 1. There will be members of the Howard County Public School system in attendance, along with other local organizations dedicated to school improvement in our county. This invitation is open to everyone, so please mark your calendars and join us for this very important event! where they may freely share their faith in Jesus.